At Paddy’s funeral last year, I stayed afterwards for a drink with a small group at the hotel which used to be the Dumbleton estate manor house, originally home to Joan’s family. A man from Wales introduced himself as Vince Tustin. I recognised the name as I had been in touch with Vince by email in the preceding weeks on the subject of his father-in-law who was in the SOE. ‘Reg Everson, my father-in-law, spent three years on Crete and much of that time he worked closely with Paddy as a radio operator.’ said Vince. Such was the impression that Paddy made on people. It is a lovely story in itself, and perhaps serves a reminder on this first anniversary of his death, that Paddy affected the lives of many, in different ways, as a man as well as a writer. Vince told me that in the 1950’s Reg was interviewed by a local reporter. 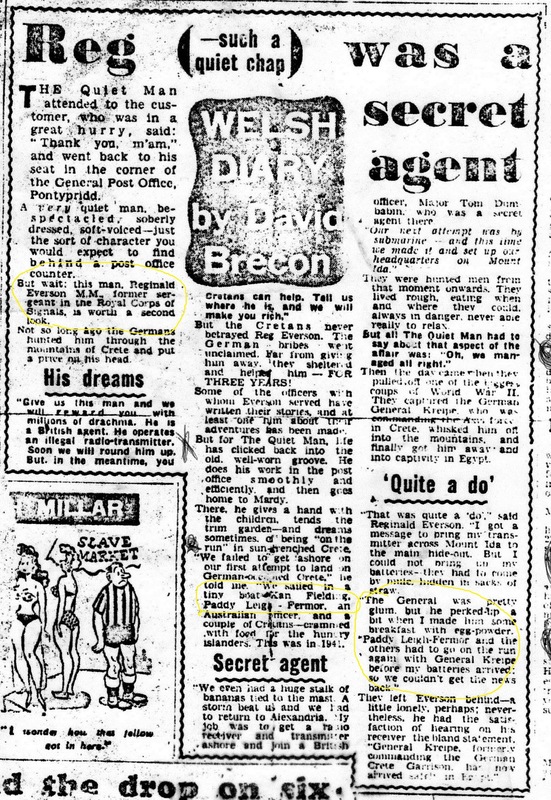 I am sure that Reg didn’t want it to sound as if he was alone [on Crete]. He was a quiet mild mannered gentleman, and was in the Royal Signals from 1931 to 1946 and like so many servicemen lied about his age to get in, he was only 15 when he enlisted. For the three years he was on Crete his wife didn’t hear from him. His commanding officer was the only contact she had. People in the village even thought Reg had left her! It wasn’t until I wrote a piece in the local paper that people understood where he had been because he didn’t speak about it. In the newspaper cutting from the 50s Reg talks about his involvement in the kidnap of General Kreipe and how he cheered up the General by making him some powdered egg for breakfast on Mount Ida. We have his forged Cretan papers here, also a leaflet that was dropped by the Germans. He was awarded the Military Medal and Africa Star among other medals. He was also presented with a solid silver medal for bravery from the Maharaja of India. 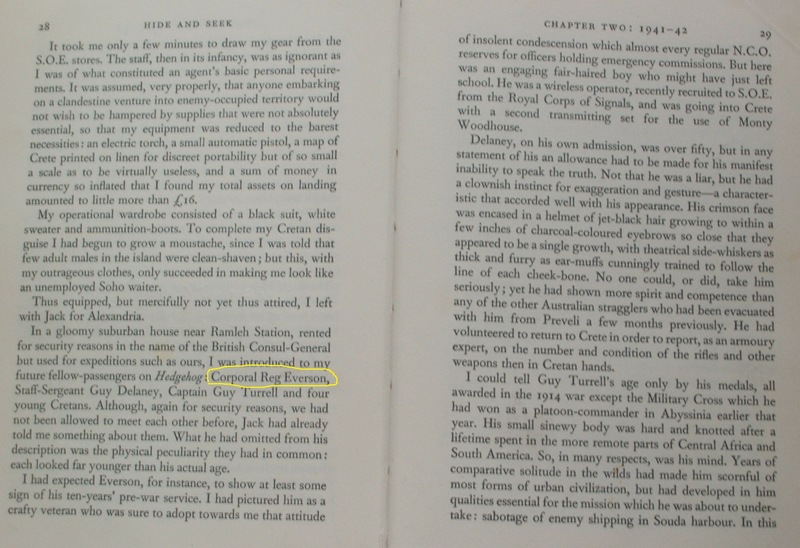 Reg Everson deployed to Crete with Xan Fielding, and Xan refers to this in his account of his time in Crete “Hide and Seek”. 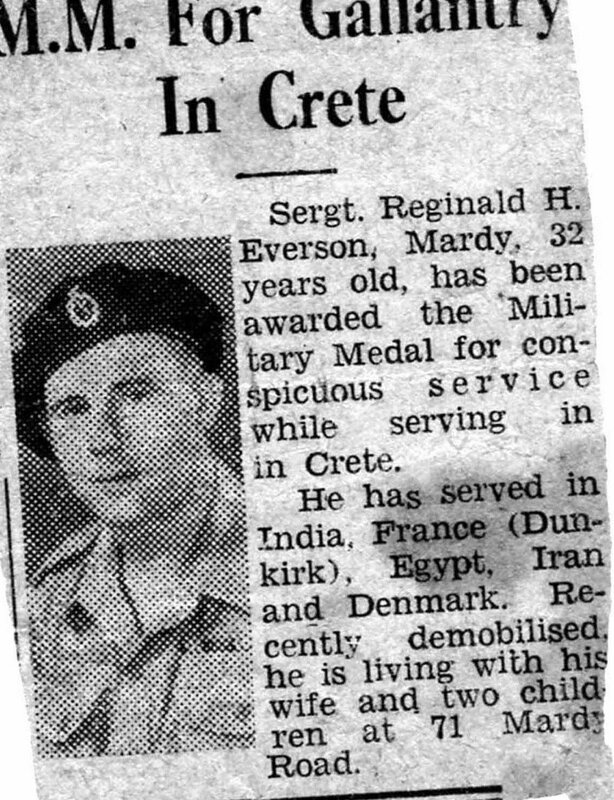 Whilst we often hear the stories of the officers in SOE, we should not forget that they were supported by a large team including signallers such as Reg Everson who were especially brave. They risked being located by the Germans who were constantly trying to find the source of their signals to destroy the radios, and capture the highly skilled and valuable operators. This entry was posted in Abducting a General, Ill Met by Moonlight, Other SOE Obituaries and tagged Crete, Greece, Ill Met by Moonlight, Major General Heinrich Kreipe, Mount Ida, Patrick Leigh Fermor, Reg Everson, Second World War, SOE, Special Operations Executive, Xan Fielding on February 9, 2016 by proverbs6to10. Thanks for this Tom…I remember I was with you, Vince and Patricia after Paddy’s funeral. Reg was Tom Dunbabin’s radio operator at the time of the kidnap, and was asked by Tom to go to the rendezvous point on Ida with Tom’s other assistants, John Houseman and John Lewis. Meanwhile Tom was ill with malaria and being looked after in a hideout in the Amari by the doctor from Agios Iannis and so couldn’t join them. The radio not working was the kidnap team’s first setback and led to them spending so long on the island whilst they arranged a pick up beach with Cairo.